TuSimple is a startup working on Level 4 autonomous driving solution for trucks since 2015. The entire startup is purely based on AI, computer vision, algorithms, and mapping technology. The company is also focusing on low carbon emission and safe self-driving technology. The startup also wants to reduce overall transportation cost without compromising the environment. The China based startup is currently testing its autonomous trucking tech on few commercial truck operators in Arizona, USA. The startup is using computer vision technology. It aims to achieve level 4 autonomous commercial trucking and so, it is developing technology in that direction. The computer vision technology views and senses the surrounding as humans do. So, the advancement to such a level brings higher accuracy and more safety. 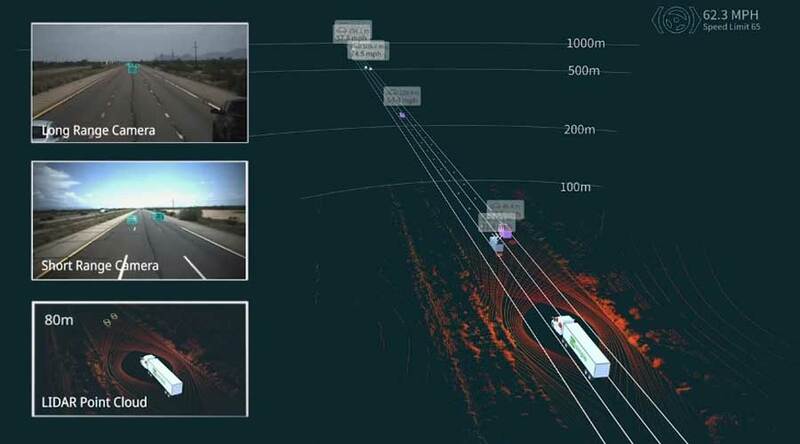 TuSimple uses camera, lidar, and radar in order to sense up to 1000 meter ahead all the time. The perception of such a long distance helps to make early decisions like lane changing, braking etc. The long hauling trucks need a long distance to brake, change lanes and take any other driving decision. This technology is a new benchmark in autonomous trucking. The TuSimple is full stack autonomous driving technology. The deep learning algorithms can interpret at the pixel level. Hence, this technology brings decimeter level of positioning accuracy in tunnels as well. The artificial intelligence system designed by the startup helps in taking accurate decisions. It includes guiding the vehicle for taking the most fuel-saving route. All the decisions are real-time in accordance with maps and current condition of terrain with real-time road condition. The TuSimple is an Autonomous Trucking company with the industry-first 1000 meter perception technology. Furthermore, the AI has the ability to take timely decisions with more accuracy every time. The high level of perception brings more accuracy and control of entire vehicle; making it safer on road. The self-driving trucks are more challenging than cars. The self-driving cars have a small length when we compare it to trucks. Furthermore, Tu Simple is working on the class-8 trucks which are nothing but big, long tractor-trailers. Tractor trailers are difficult and challenging to automate as tractor and trailer are attached together and movement of both needs to be coordinated. You can't simply put sensors on the trailer and make it autonomous. Furthermore, the company is not manufacturing trucks but it is making a platform that can be implemented on the trucks. Such systems and platforms bring more flexibility and it also increases the adoption rate among the companies. In conclusion, The new startup will soon set a benchmark in the increasingly crowded self-driving trucking industry. Omni directional wheels…now drive 360 degree!